I'm pretty sure by now everyone knows Eyeko, a bespoke cosmetics label famous for their original packaging and super collab with it girl Alexa Chung. A graphic eyeliner is a must have on my daily make-up to help define the eye shape and give that 60's look that everyone loves. 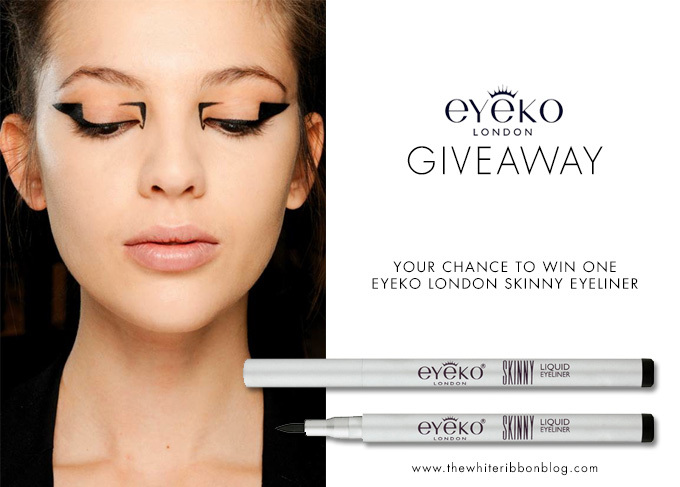 For all of you craving for an eyeliner that will make you feel like a 60's kitten I have an Eyeko Skinny Liquid Eyeliner to giveaway, how cool is that? All you need to do is follow the instructions, and good luck! Penso que por esta altura já todas conhecem a Eyeko, uma marca de cosméticos famosa pelas suas embalagens super cool e pela sua colaboração com a it girl Alexa Chung. Ter um risco de eyeliner bem definido é algo que não dispenso na minha maquilhagem diária, ajuda a definir o olhar e confere aquele look 60's que adoro. Para todas aquelas que têm estado ansiosas por experimentar a Eyeko, tenho um Skinny Liquid Eyeliner da marca para vos oferecer, tudo o q têm de fazer é seguir as instruções e, boa sorte!